The words “Homes Instead” and “Shut It Down” lit up on a large tent-like building at Homestead temporary influx shelter on March 29, a day after the U.S. government declared it apprehended a record 75,000 migrants at its Southern border in February. Miami artist Alessandra Mondolfi and her fellow protestors traveled to Homestead, a city an hour south of Miami, to picket outside the nation’s largest shelter for unaccompanied migrant children and demand the government to reunite the kids with their relatives. Today, one in six of the 12,500 migrant minors currently in the custody of the U.S. government are at this location. 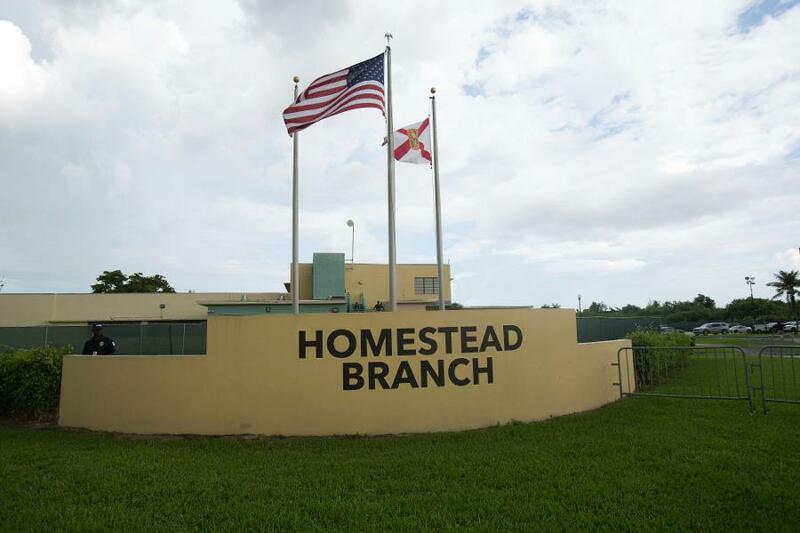 Homestead, which by mid-April will hold up to 3,200 children, currently provides shelter to 2,200 children ages 13 to 17. That is 850 more children than in February, when Forbes first started reporting on the center. Since 2014, the U.S. government has heavily depended on contractors to manage shelters for migrant children. Most of the over 100 shelters used by the federal government are run by big nonprofit organizations such as Texas-based Southwest Key Programs. One exception is Comprehensive Health Services, which, based on Forbes’ reporting, is the nation’s only for-profit youth migrant shelter operator. CHS runs Homestead, the biggest shelter for unaccompanied minors in the country and also the only temporary influx center for migrant children. Its chairman Thomas Campbell is the founding partner and majority owner of private equity firm DC Capital Partners, which bought CHS in 2018 for an undisclosed sum. Forbes estimates that DC Capital pulls in millions of dollars a year from government contractors it owns. That includes CHS, which pays DC Capital an annual management fee of $1 million, based on a 2018 agreement between the two firms signed by Campbell on behalf of both entities. CHS, DC Capital, and Caliburn all declined to respond to questions from Forbes. In 2018, the federal government paid CHS more than $210 million for its shelter work, according to federal filings. CHS, which was founded in 1975 and has dispatched medical teams around the world from Iraq to New Orleans, employs 13,000 medical care professionals globally. The company provides medical services, including worksite health programs, emergency care, surgeries and evacuations. On its website, CHS claims that it currently serves 7,000 personnel in Iraq where employees perform medical operations and provide lab services and emergency trauma units. It expanded into shelter management in 2015. Thomas Campbell, who owns at least 75% of DC Capital, declined a request for an interview. Still it is easy to understand the appeal of CHS to him. In July 2017, border officials in El Paso, Texas implemented policies which required that minors be separated from their parents or legal guardians if they entered the U.S. illegally. In April 2018, the Trump administration formally instituted the practice under its “Zero Tolerance policy”. Though Trump ended the policy in June 2018, the total population of children in federal custody reached its highest level in history last year, according to a 2019 report by the National Center for Youth Law. Campbell has a long track record in private equity. Eight years after he graduated from Lehigh University in 1980, Campbell met fellow investor Robert McKeon at a boutique investment bank on Wall Street. McKeon founded the investment bank Veritas Capital in 1992 to invest in small and mid-sized defense contractors, and Campbell joined him; they then expanded into private equity under the umbrella of Veritas Capital Group. The duo bought global government services provider DynCorp International in 2005 and took it public a year later. When McKeon pocketed more than Campbell from the IPO, the partners had a nasty falling out. Campbell founded his own firm, DC Capital, in 2007 and eventually settled with McKeon in April 2012; the terms were never disclosed. Five months later, McKeon committed suicide. Campbell’s rise as a government contractor may have been inconspicuous, but by the time President Trump assumed office in January 2017, he was well positioned to benefit from the new administration. In February 2016, former White House chief of staff John Kelly joined DC Capital’s board of advisors, his federal disclosure forms show. (In the filings, he also declared he had no stake in the company). He resigned from DC Capital upon his confirmation in January 2017, promising that he would not work on any matter involving the portfolio companies in 2017. During Kelly’s tenure as the Secretary of Homeland Security, the department was one of many clients of DC Capital, and six months after Kelly assumed the role of White House chief of staff, DC Capital bought CHS. Kelly could not be reached for comment. The policies of the Trump administration may have brought Homestead and CHS into the spotlight, but the history of the facility dates back to President Obama. Just about four years ago, a Job Corps facility next to the U.S. Air Reserve Base in Homestead shuttered its doors. After sitting unoccupied for close to 8 months, in January 2016 the federal government converted the old facility, where students used to receive free training in dozens of career areas from business to health care, into a temporary influx shelter for unaccompanied minors. That same year, the Obama administration outsourced the management of the Homestead center to CHS. In April 2017, the government shut down the facility due to decreased need for extra beds, the ORR told Forbes in April. Although the private medical services provider doesn’t disclose its financials, a public records request revealed that CHS pulled in $236 million in revenue in 2017. In the first seven months of 2017, CHS reported a 19% net profit margin, according to another public filing. While 2018 numbers are not available, CHS’s revenue from government contracts close to tripled between 2017 and 2018, federal data shows, mostly driven by the increased business at Homestead. The Department of Health and Human Services, which oversees the Office of Refugee Resettlement, signed a $51 million four-month contract with CHS in February 2018. The government, according to a federal database, first paid CHS a little over $22 million for 500 beds at Homestead but then amended the agreement to accommodate double that number in May. Less than two months later, the ORR increased its emergency shelter operations at Homestead to 1,350 beds, which resulted in CHS snagging another award with the government—but this time, worth $234 million over a 9-month period. The latest amendment to the agreement in late March increased the bed number at Homestead from 1,600 to 2,350. Homestead is only a start for CHS. In January, it received licenses to run three shelters for unaccompanied minors in Texas. As of March 21, it housed 531 migrant children in that state. CHS estimates revenues of over $61 million from its first year of operations in Texas and $5.2 million in what they label as “fee/income”, according to the company’s fiscal plan dated June 2018. This article was written by Deniz Cam from Forbes and was legally licensed through the NewsCred publisher network. Please direct all licensing questions to legal@newscred.com.